I don't often bake shortbread. My first attempt on shortbread stamped cookies here. In just a few more days, we will be preparing and celebrating the Christmas festive season in December. 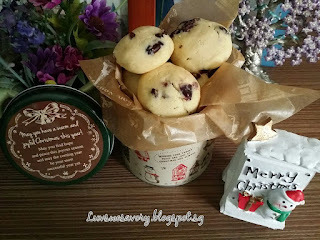 My usual baking for some biscottis or cookies as giveaway for my family has already began. 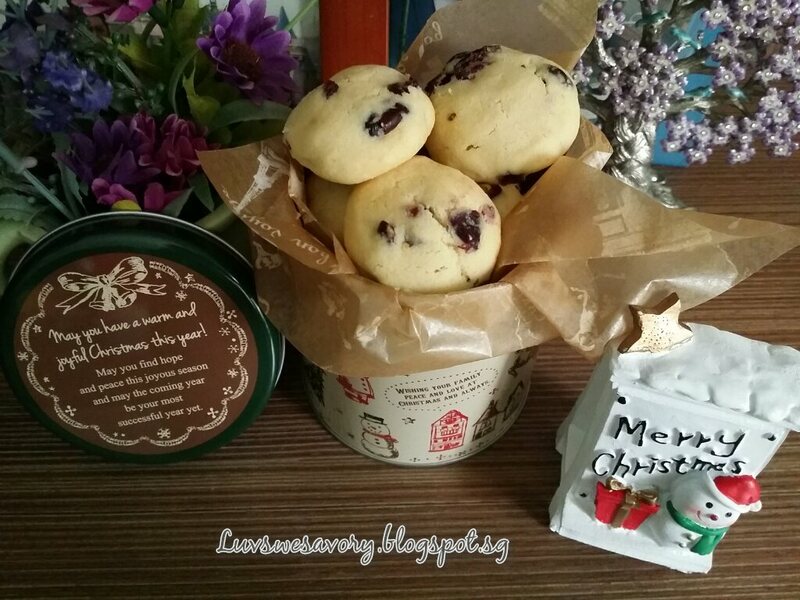 One of the “must-use” dried fruits … dried cranberries for most of the biscottis and cookies recipes. 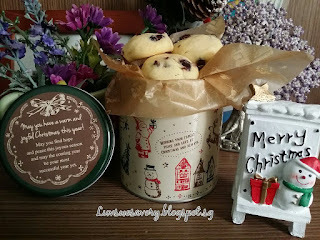 Starting with this citrus tangy flavour shortbread cookies.... infused with citrus lemon zest and tangy dried cranberries. Instead of slicing the cookie dough, I made them into rounds. Below my slightly modified version as I've halved the recipe and reduced the quantity of sugar & cranberries. 1) Combine the flour, baking powder, and salt in a bowl; set aside. 2) In the bowl of your electric mixer (or with a hand mixer), cream the butter and confectioners' sugar until smooth. Scrape down the bowl occasionally. Stir in vanilla and lemon zest. Gradually add flour mixture and mix to combine. Take bowl off mixer, fold in the cranberries into the dough and mixing just enough to evenly combine. 3) Place dough on cling wrap. Adjust and roll the dough into log about 1.5 inches diameter, 7 inches long. Wrap the log in cling wrap and chill in the refrigerator for at least 4 hours. 5) Remove the cling wrap, and cut the cookie dough into 1/2-inch. Using your hand, make the dough into rounds. Place it on the prepared baking sheet and gently press to flatten top. Space the dough well apart about 1 &1/2 inches between each cookie. 6) Bake in the preheated oven until firm about 12 - 14 minutes. Cool slightly on the baking sheet (about 3-5 minutes) before transferring them onto a wire rack to cool completely. Store them in airtight container. Thanks to Marshall Cavendish International (Asia) Ltd for this opportunity. 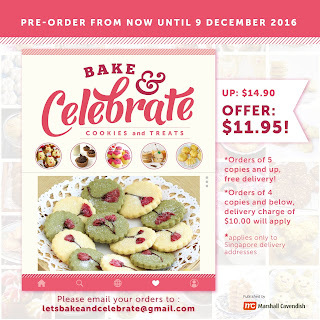 I am excited to be part of this collaboration project .… One of my cookie recipes will be featured in this "Bake and Celebrate : Cookies & Treats" Cookbook. The books will be out in stores in December and in time for festive seasons like Christmas & Lunar New Year, so it will make for a wonderful gift for family and friends! 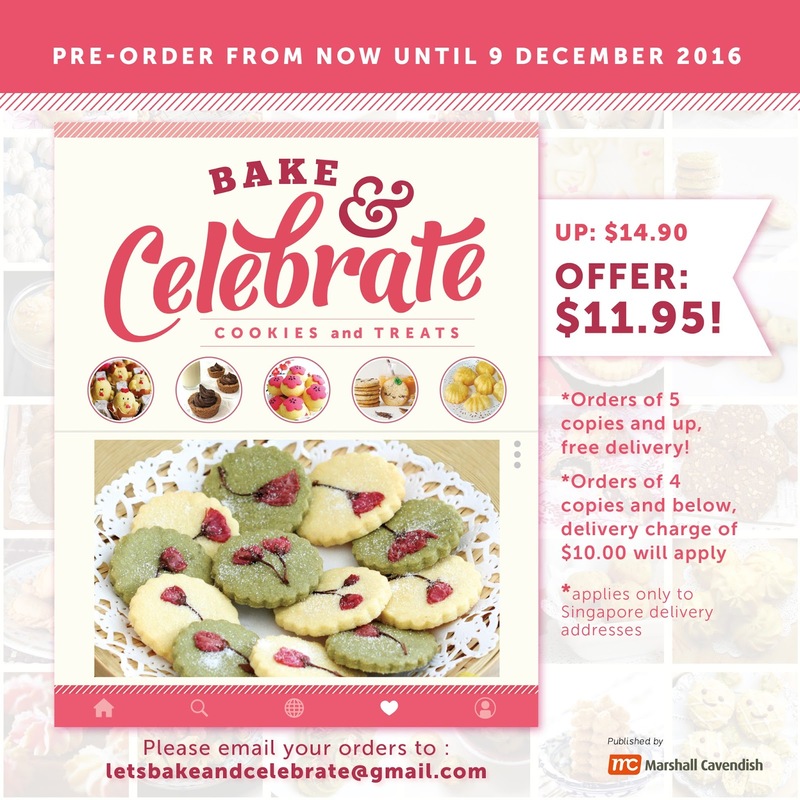 A special pre-order price of $11.95 per copy from now till 9 December 2016. You may place your order and direct any enquiries to letsbakeandcelebrate@gmail.com. Please refer to the poster for more information. Karen, already baking for Christmas! Then it will be for CNY. So fast, right? I am not so familiar with shortbread. I suppose it is something like butter cookies. 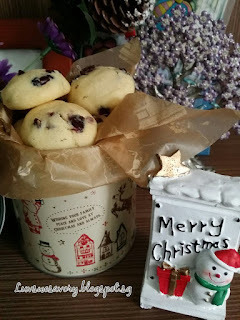 Hi Karen, I love baking with cranberries too, these cookies look delicious!